Meg's Boutique: Video- June Favourites! I've had a very fun girly day today with an indoor picnic as the weather has been awful yet again! I also got some incredibly exciting blogging news today, but I'm going to write a whole post on that either later tonight or tomorrow so just keep your eyes peeled! I hope you've all had a great start to the week! i really want to try all the products you've listed! especially the bb cream. i also enjoy simple products. i ran out of my boscia moisturizer and i might try a simple one instead. great list of favorites! I want to try the argan oil products! 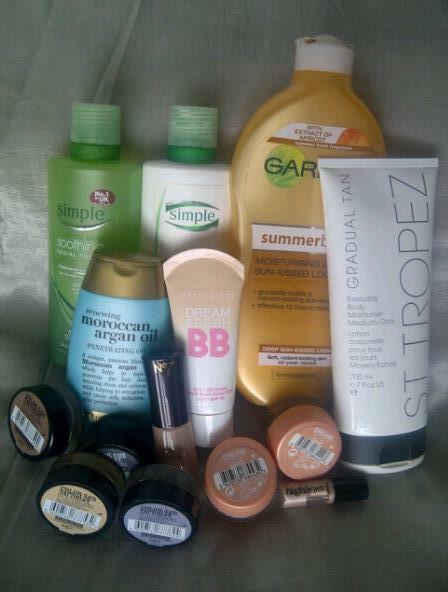 i have been using the st. tropez tan a lot recently, especially with this horrid weather! SO many of my favourites on here, summerbody, colour tattoos and dream fresh BB! I love watching your monthly favs....i def want to try the maybelline bb cream now!